One of the things I discovered when I pulled together my thoughts regarding the image at right is that it is the most recent in a related series. Predating the black-and-white digital composition is an unfinished oil painting. And long before both there was the ornately carved exterior of a large trunk my grandmother brought back from “the Orient” in the 1920s. Also it appears that the process by which the reptile image migrated from canvas to pixels was not entirely conscious. I do not recall most of what occurred. Rather, my contributions were like what might be expected of a hired hand who can follow instructions but really isn’t all that personally engaged in the work from moment to moment. I recall gazing blurry-eyed into the computer screen, chiding myself for putting so much detail into the feathery mane that extends down the creature’s back. By the time I had applied an inch or so of overlapping half moons I was utterly bored with the process. I considered deleting the mane “layer” and starting over, employing some other, simpler graphic element. But I found I could not let go of what I had already done. And there was nothing for it but to grit my teeth and apply more, ever-smaller flourishes down the creature’s spine. When I finally reached the rump, and the mane was done, the emotion was like hearing the whistle blow at 5 pm on a Friday. A rush of delight that the time of servitude had ended and I could now put my feet up on the desk and whistle. Or smoke a cigar. Or do any other simple, pleasurable thing I felt like doing. On the other hand, my feelings concerning the unfinished painting at left include no small amount of disappointment with myself. That canvas has hung on my bedroom wall for nearly 30 years. In other words, it has literally hung over me while I slept for almost three decades. I’m sure I copied the basic image from the unfinished painting to my computer screen, but most of the details of the transfer have entirely escaped me. Except as noted above, when some requirement of the execution became annoyingly tedious, the hired hand in me just followed instructions while my thoughts busied themselves with nothing in particular. And I was certain that the clouds and sky needed to be almost completely concealed in mist. I imagined applying layer upon layer of light gray-white dustings, but I knew my hands were not ready to perform such delicate work. I knew the dragon would need to have a highly detailed scaly skin, and lots of wispy, swirling, long black hair that extended down along its back. Again, I had a strong sense of what I needed to do, but I also knew I was not ready to do it. I comforted myself at the time with the idea that if I worked on lots of other paintings and tried all sorts of complex and delicate things, I’d eventually be ready to finish the dragon, but that never happened and the canvas has remained as you see for many years. One night while lying in the dark thinking about composing this blog, with the painting hanging nearby, I remembered “the Chinese chest” – the marvelous old trunk that’s been in storage since my mother’s death. A portion of the trunk’s carved exterior is pictured at right – a dragon rampant, flames erupting from its mouth, surrounded by billowing smoke. That image was suddenly vivid in my thoughts, and I remembered how it had served as a doorway to worlds beyond the physical boundaries of my childhood. The small house in which I grew up was one of about a hundred tract homes clustered close together on small lots separated by low chain link faces. To the west was a huge oil field that extended further than the eye could see. The sun would set through a red and purple haze beyond a forest of wooden derricks. All night, orange gas jets wriggled from the mouths of narrow pipes standing upright a hundred feet in the air. Just beyond the back fences of the homes on the northern edge of the housing tract, a muddy creek ran along the bottom of a narrow gully, overgrown with scruffy trees, and full of crawdads, toads and swarming mosquitoes. To the east lay a somewhat older, grander and unwelcoming cluster or tract homes…no crabgrass, but lots of dichondra and ivy. To the south, orange groves stretched away in impossibly straight rows that all seemed to converge into the same small point on the horizon. Here and there a farmhouse, alone and melancholy. Some long abandoned. Environments that provided abundant opportunities for adventure and childish misbehavior were just a short bicycle ride from my home in all directions. But the doorway through the dragon was near at hand, in the living room of our house. Rain or shine, high noon or late at night, indistinct in the pale yellow glow from the porch light outside. The ritual was simple. A fixed, unhurried gaze upon the carved features, a forgetting of oneself… Then being elsewhere. 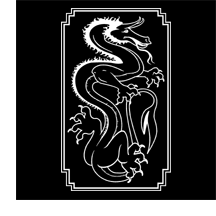 Like the dragon pictured on the box, floating, untethered, entirely at liberty to appear and vanish in swirling smoke. I have to ask myself, “Where’s the fire?” It appears I left it on the trunk, since there’s no sign of it on the canvas or in the black-and-white digital composition. And what does that mean? Apparently something significant since I know what I have drawn is a lizard, not a dragon. Perhaps you have some ideas. This entry was posted in Image Descriptions and tagged Childhood, Dragon, Lizard, Memories by thrum. Bookmark the permalink. I am amazed that you are such an advanced artist. Seems good to articulate as best as possible what inspires the specific artistic action, as in a painting, but what I look forward to is seeing more of your amazing work. 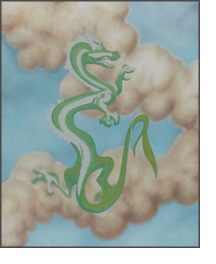 The green dragon in clouds is beautiful, indeed. Hope I’m “blogging” correctly. Tom, your encouragement means a great deal to me. I’m very new to blogging too, so I really don’t know what might constitute correct blogging. But the thoughts you expressed above sound like you. I can hear your voice when I read the words. I can’t think of anything that would seem more correct to me. At this point in time I’m speechless! I’ve always considered the “lizard” to be a dragon…it never entered my mind that that it might be something other than the mythical creature. The “lizard” you discribe in your post and the one depicted so brilliantly in both digital and oil paint form, stirs a strong feeling of fear in me at its very sight and yet a still stronger need to get closer; to know more about the dragon; does it indeed have scales…if I stare a little longer, without blinking, will fire shoot from it’s mouth? I may never have the answer to these questions, but one thing is for certain, I will always long for them each time I gaze upon the work…isn’t that the artist’s real genius? Orwrence, your kind message reminds me of a gracious custom — one person creating something in response to something someone else created. A response of creation. Yours, so warm and finely crafted, is very, very much appreciated. Here you tell us about the process of drawing the Sky Lizard, but what does the image itself say to you, now that its life is independent of your own? Are you describing a circumstance in which a psychic component achieves personhood and can be engaged in conversation? I have not had an experience like that in this situation. At least not yet. Rather, my participation in the evolution of the image feels like a dream that is also a self portrait, and has left me ill at ease. I would very much like to hear the lizard’s theory regarding why there is no fiery breath. But at the moment we are a single puzzled discontent. Let’s talk later. would love to see a bigger image. send it over if you like. love and miss you! Love and miss you too! The larger image is on its way. Looking forward to chatting.